One day a wolf had a bone stuck in his throat. It gave him much pain. He requested everyone to take out the bone. But nobody helped him. At last, he saw a crane walking in front of him. He’ requested the crane, again and again, to take out the bone from his throat but no pay head. At last the wolf told the crane that if he could take out the bone from his throat, he would give him a lot of fishes to eat. The crane agreed to this proposal and went to the wolf and requested the wolf to open his mouth. The crane took out the bone easily with the help of his long beak. Then the crane asked the wolf to give. the fishes as promised. 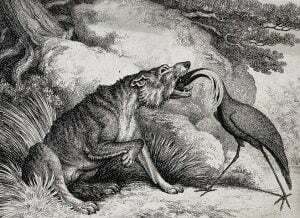 At this, the wolf became angry and told the crane that he was lucky enough that he would not eat him. It was his great reward, wasn’t it? Hearing this the crane went way with a heavy heart.